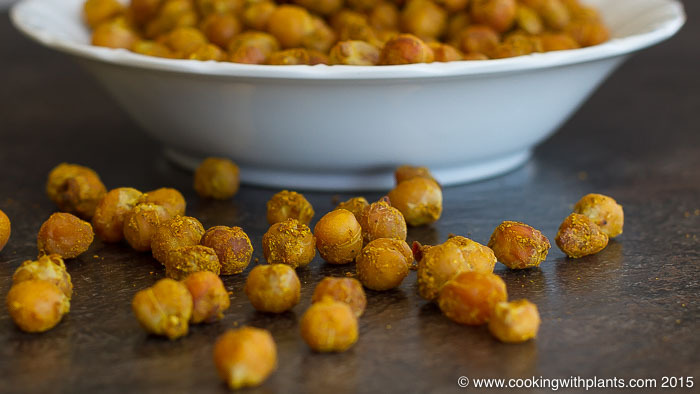 These oven roasted crunchy curried chickpeas are so delicious… eat them on their own as a vegan snack, or great instead of croutons in a salad. This is such a simple recipe – quick, easy and tasty! Preheat oven to 200 degrees Celsius / 400 degrees Fahrenheit. Put all of the ingredients in a mixing bowl and stir well to combine. Place coated chickpeas on baking tray and place in oven. Cook for about 30 to 40 minutes depending on how crunchy you want them. Toss the chickpeas around every 10 to 15 minutes so that they crunch up evenly. Eat straight away as a snack or put over a salad. YUM! You can store any leftover chickpeas in a glass jar with a screw top lid. I want to make these right now but don’t have any maple syrup on hand. Is there anything else you recommend as a substitute? Maybe some coconut sugar mixed with a bit of hot water, or some brown rice syrup.